Central City East notes that the LATimes beat the blogdowntown pic post by a few minutes (ok, longer). Shame on us. But there's a little something extra on behalf of downtown bloggers. It's after the jump. 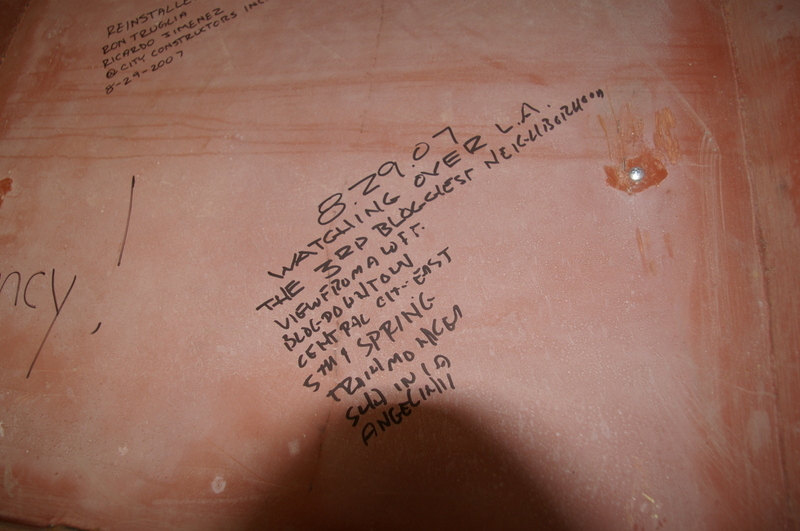 I joined those signing the inside of the cupola on behalf of the third bloggiest neighborhood, until it started to spin and felt it was best to get out, hence the fast writing (Now, I may have to find a way to climb up and take out central city east). awesome. thanks for the inclusion. i'll have to buy you a drink at the next blogger meet-up at little tokyo showgirls. Thnaks ED , but it wasn't a few minutes it was over an hour before you guys posted on blogdowntown. Sorry , but for some reason we were slow on the draw today. But our trusty ED Fuentes was there today. Thanks for not forgetting me in the cupola. Haven't been feeling well lately. Plus the Town Crier doesn't have a bell right now. that's too cool...and so are you. thank you!!! celia: We better hurry on that drink. LACityNerd: I was remissed in not having you included. The same happened to BGFA, although he notes he is on "blogging probation"
AH!! I just noticed this! Thanks so much, Ed! !